BBC NEWS | UK | What are crash investigators doing? What are crash investigators doing? 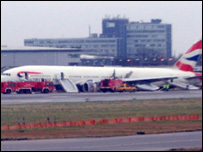 The day after a Boeing 777 aircraft crash-landed at London's Heathrow airport, a team of accident investigators is at the scene, examining the wreckage. Their aim is to gather as much information as they can to help them understand what caused the accident and what could be done to stop it happening again. The investigation is being carried out by a team of six specially-trained accident investigators from the Air Accident Investigation Branch (AAIB), headed by senior air accident inspector Robin Tydeman. Their first task is to inspect the plane as it lies on the runway, including finding a way of looking underneath it. It has been suggested they might use airbags to raise the aircraft up so they can get a look at its underside. Investigators have also been examining the marks left by the aircraft as it landed, skidding across grass by the side of the runway. Two team members are focusing on engineering aspects of the crash and two on operations aspects, such as the way the plane flew. A fifth member is at the AAIB's Farnborough headquarters, examining the information contained in the black box flight recorder and cockpit voice recorder, which have been recovered from the plane. 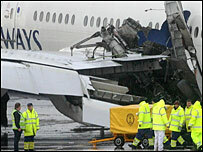 They have already interviewed the pilot and crew and will examine the aircraft's maintenance log and the captain's log. Accident investigator David Gleave, of Aviation Safety Investigations, said the investigation would also look at how the flight crew reacted, how well the evacuation slides worked and whether any of the passengers were injured during the evacuation. Key questions would include how well the engines performed and whether they failed during the flight, as well as how well the flight controls functioned. David Stewart, spokesman for the AAIB, said: "They will be particularly interested in the weather conditions and any unusual occurrences - for example, we've heard rumours about birds going into the engines - and any air traffic control information." Once they have done all they can on the runway, they may decide to move all or part of the wreckage to the AAIB's hangars in Farnborough, where it could be examined in further detail. In any case, the plane will have to be moved from the airfield at some point, to allow the runway to resume normal operations. But Mr Stewart says the team will be given as long as they need to complete their examination before clearing away the wreckage. "Their only pressure will be to understand as quickly as possible what caused the accident in the interests of aviation safety." Once the wreckage has been removed, the Civil Aviation Authority will check the part of the runway affected to ensure it is safe to use. The investigators will be in contact with aircraft manufacturer Boeing, which built the plane, to see if it can shed any light on the accident. As the plane was manufactured in the US, the National Transport Safety Board - the American equivalent of the AAIB - will also be involved. The AAIB team has said it will give a statement of known facts within 48 hours, though this is not expected to include speculation about the cause of the crash. It should produce a preliminary report within 30 days, with a full report to follow, perhaps several months down the line. Mr Stewart says the fact all the passengers and crew survived and that the aircraft is relatively intact will be a major boon. He said: "It's all there. They should be able to get a lot of information very quickly - though these things do always take time." Mr Gleave said that the team should start to have an good idea of what went wrong by the end of Friday. He said: "We have such good systems on board the aeroplane for recording what's gone on and the aeroplane is in a pretty good state to be able to retrieve these recorders fairly quickly. They should have the information out and be analysing it during today. "They may need to go back into the aircraft fuselage to take a look at the systems or strip down the engines and take a look at those and from there they'll have a good idea of further actions to take. "But I think calling for the premature grounding of the aircraft is not called for at this point."